What if your camera could see everything you can see? The human visual system has a field of view of around 135 x 200 degrees, but a typical camera has a field of view of only 35 x 50 degrees. Panoramic image mosaicing works by taking lots of pictures from an ordinary camera, and stitching them together to form a composite image with a much larger field of view. 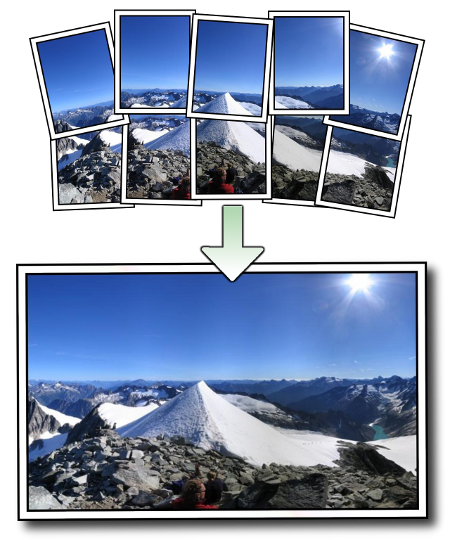 AutoStitch takes a step forward in panoramic image stitching by automatically recognising matching images. This allows entire panoramas to be constructed with no user input whatsoever. AutoStitch is incredibly simple to use! Just select a set of photos, and AutoStitch does the rest: digital photos in, panoramas out. For 32-bit Windows users here is the older Win32 demo version. AutoStitch works from unordered collections of images, automatically finding matches between images using the SIFT algorithm. It then robustly aligns all images and uses advanced blending algorithms to form seamless panoramas (see below). For more details, see our research papers. AutoStitch is available to license from the University of British Columbia. Licensing is handled by the UBC Industry Liason Office, please see this page for details and contact information. The University of British Columbia has also granted a commercial license to Industrial Light & Magic (ILM) www.ilm.com, a Lucasfilm Ltd. company, to use AutoStitch software to produce panoramas for film production. The version of AutoStitch on this website is a demo only. Individuals or companies are free to use images that they generate using the demo version of AutoStitch without restriction or royalties so long as they acknowledge the use of AutoStitch in such works. A commercial license provides access to the C++ source code. Q: How do I get AutoStitch to stitch the panorama fullsize? A:Go to Settings or Edit->Options and set Output Size to 100%. Then select Play or Stitch->Start. Q: What projection method does AutoStitch use? Does it support full view panoramas? A:The demo version of AutoStitch uses spherical projection and is capable of stitching full view 360 x 180 degree panoramas (everything visible from a point). Cylindrical and planar projections are not supported in the demo version. Q: Why doesn't AutoStitch recognise multiple panoramas? Q: Does AutoStitch support planar stitching, such as flatbed scans or aerial photographs? A:The demo version of AutoStitch assumes that the camera is rotating about a point, so distortions will be visible when stitching multiple views of a planar surface.